As doctors aim to increase patient engagement in their practice, many are starting to turn to data to better understand patient needs. For many reasons, several of which we’ll discuss here, a patient’s full understanding of, and engagement with, their health care experiences are vital for a positive outcome. And today, we have more options than ever for achieving higher levels of interest, patient engagement, and “buy-in” from health care customers. These include data-rich wearables, telemedicine for housebound patients and electronic health records that follow us around as we switch providers or seek treatment from specialists. We’re positively swimming in data. But all that noise stands a good chance of confusing or distracting patients from their ultimate goal of ongoing good health if doctors and patients don’t come to the table together with a plan and a common understanding of which data points are meaningful in context and which are not. There’s no doubt anymore: Big data is going to revolutionize the way we administer health care throughout the world and help us achieve financial savings. 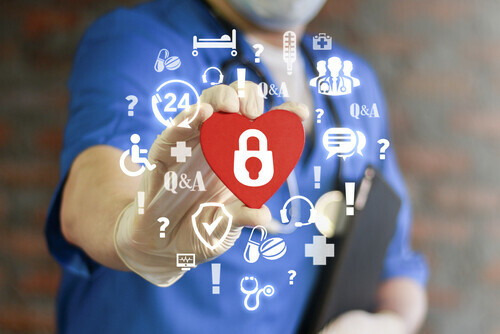 But as doctors look to leverage modern tools for interacting with and sharing patient health data, there are several factors to remember and several key advantages worth checking out. Here’s a rundown. Regrettably, we still lack a cure for many chronic diseases. Therefore, doctors and their patients must instead “manage” these conditions. It’s possible to live a full and active life while undergoing treatment for severe diseases and conditions, but only with the right levels of vigilance and engagement. Patients with chronic illnesses must maintain their motivation, their attention to treatment and medication schedules and their general knowledgeability about their condition. Maintaining a working knowledge of how the condition and treatments are progressing is vital for patients to keep good morale. Lapses in treatment can add to the overall costs of treatment, which is why vigilant adherence to treatment plans, as laid out by doctors and specialists, is so important. Not every chronic condition requires constant trips to the doctor’s office. In many cases, self-management of these cases is possible, and patients can independently administer medicine and engage with their health outcomes without regular trips to a doctor’s office or exam room. Working together, doctors and patients can use real-time and historical health data to better understand the individual’s holistic health and draw up bespoke treatment plans for their unique circumstances. One part of the equation involves applying predictive models to anticipate future changes or unexpected turns their health condition might take. For instance, gathering and organizing data from a large number of insured people lets data-driven health care systems and insurers more accurately take into account social and geographical “determinants” for future patient health. This process can help break down a health care system’s roster of patients by risk type — such as proximity to environmental conditions with known connections to patient health. Plus, not everybody has a history of responding the same way to known pharmaceutical treatments. And not every patient is equally likely to make the lifestyle changes recommended by their doctors. We’ve entered an era in health care where insurers and doctors will eventually begin requiring patients to wear health and fitness monitors as a matter of course. Doing so ensures everybody remains on the same page and that doctors can draw the most personalized conclusions possible from the reams of data such devices collectively produce. Health care is a product, like it or not. And whether we’re purchasing that product on some convoluted health care exchange, or we live someplace where health care is an understood right of being a citizen, we all buy into this product one way or another. But even in countries where a single-payer system spreads out the liabilities and costs among patients and consumers and helps drive down prices for everybody, health “literacy” is still a real problem almost across the board. We all know the jokes about doctors’ handwriting. But that’s not the kind of literacy we’re talking about. Often, the valued customers of the world’s health care systems lack even basic knowledge about human health or turn to poor sources of information, such as doctors who skate by on name recognition alone. Patients who don’t understand their situations in full are less likely to adhere to medication and treatment schedules consistently. Lab results tend to include medical terms patients don’t necessarily readily understand. And the generally poor doctor-to-patient ratio in the U.S. and elsewhere means doctors don’t always have the time to make sure patients leave their practices feeling confident and informed. Misinterpreted lab results are common as a result. Natural language processing has had a long road to relevance as the technology has slowly come of age. But in 2017, researchers from Yale, the University of Massachusetts and the Veterans Administration applied natural language processing algorithms to the task of demystifying electronic health records, or EHRs, to make them more easily digestible for laypeople. They wanted to see whether a computer algorithm could promote better communication about health. It did. Indeed, it worked so well it outperformed the researchers’ expectations, even with unsorted and unlabeled data from patient evaluations. Another 2018 study, now made public by e-health publisher JMIR, confirmed the original findings: When patients and health care providers use natural language algorithms, themselves powered by big data and machine learning, patients have a far and away more complete understanding of their health. After a few tweaks to the systems, researchers even found patients’ ability to recall complex medical definitions later had improved further. Health care systems can pivot from reactionary to proactive treatment as health databases become richer with relevant patient data. Algorithms are already making it much easier to match patients with relevant clinical trials that might deliver results. Using data encourages hesitant patients and ensures the most compatible matches. Hospital readmissions might drop as a result of doctors and patients having more tools for anticipating setbacks in the recovery process. When we empower people with knowledge about the condition of their bodies, they make better lifestyle choices. And when that happens, we enjoy a healthier population overall. It shouldn’t come as a surprise, but the effectiveness of our communication and the quality of our information are two of the keys we need in hand to build a health care system that works the way it’s supposed to. Megan Ray Nichols is a freelance technical writer and the editor of Schooled By Science. She enjoys writing about the latest news in technology, science, and manufacturing. When she isn't writing, Megan loves hiking, biking and going to the movies. Is Robotic Process Animation The Next Evolution Of Big Data?